So far, the subs I'm getting from Sage (CR rips but touched up a little) have not been that bad. The moment that "-chan" gets translated as "-poo" again, I'll probably just cry in frustration. This batch included a focus change, wherein ep02 was about Ritsu and Takano and ep03 jumped to the Hatori-Chiaki-Yuu situation. Seeing how ep01 went, I would have been incredibly angry with this switch had ep02 not gone so well. The way it was described by Envy (how dare she spoil the plot for me; I should return in kind) was that Ritsu and Takano were finally together. After getting over my rather embarrassing girlish squealing manly happiness, I actually watched the episode and, more or less, she was right. I'm sure the printers know clearly what's going on. The plot point of ep02 was that, despite it nearing Christmas, the editors at the Emerald Department were incredibly busy due to the inconveniencing deadline changes posed by the fact that members of other departments (like the printers) were going on holiday breaks. 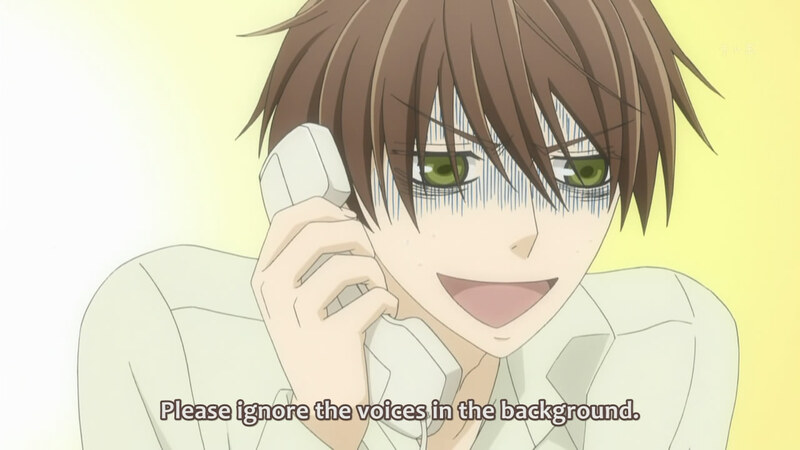 Even with these busy days, the relationship between Ritsu and Takano could still grow. The aftermath of their night together was downplayed, since Takano seemed to be able to leave Ritsu alone instead of getting immensely pissed off that it was forgotten, but Ritsu still internally thought about it. These kinds of thoughts, around since the end of Season 1, made me pretty excited for the episode, Envy's spoilers aside. That is a little shameless. But Takano probably sees Ritsu in a personal light. 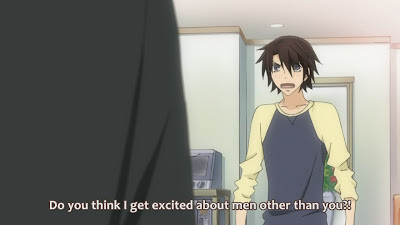 The full brunt of the fact that Takano had slept with Ritsu despite being in a relationship sent Ritsu into a spiralling emo world, where he tried to avoid Takano, but he seemed to shape up a little by the time the department headed out to dinner together after work one day. 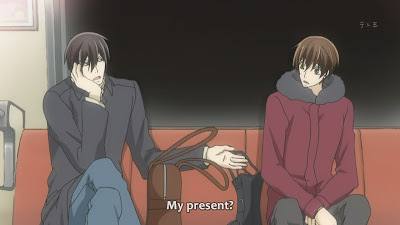 On the train ride home, he maturely wished Takano a happy birthday - an opportunity that Takano took to almost "guilt" Ritsu into hanging out with him on the day itself. Despite his attempts to get out of it, the 24th saw Ritsu getting picked up by Takano for a long drive. 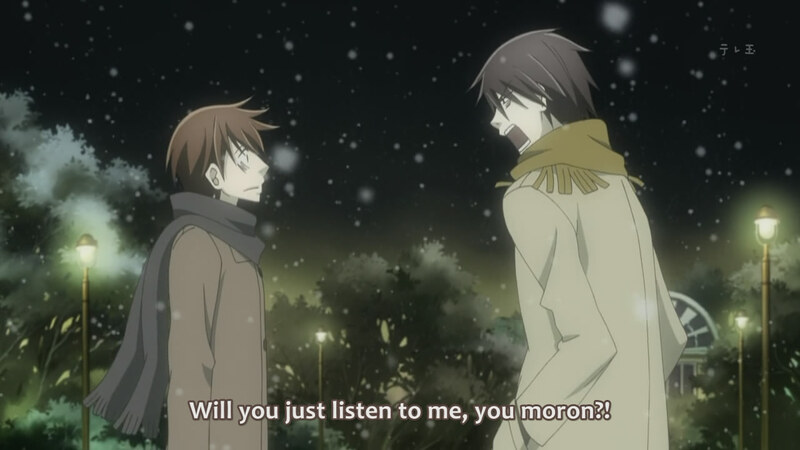 While there, the two really did seem to bond - and by that I mean that Takano really just yelled at Ritsu. So he's dealing with a tsundere lover. Good luck. It's difficult to summarize such an important scene. 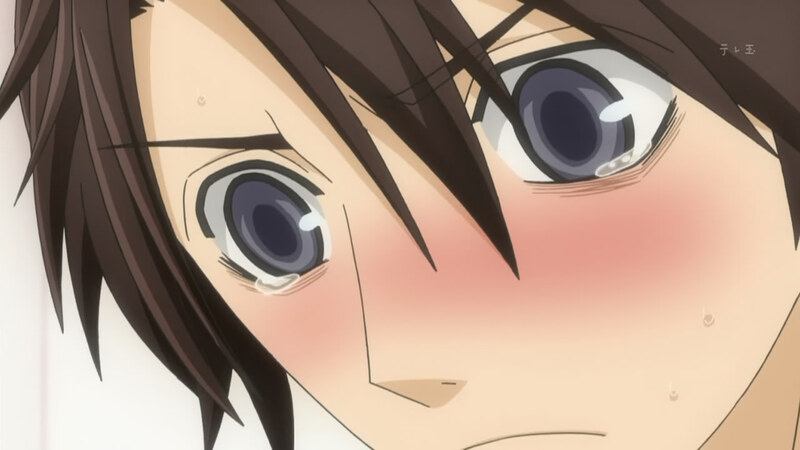 Takano seemed to finally get through to Ritsu, asserting that he and Yokozawa had dated in the past (though it was more of a heartbroken daze for Takano, as it occurred during college and he was still getting over Ritsu), but there was nothing there any more. As they headed back to car, Takano shared that, while the two had still been dating back in high school, he used to imagine the things they could do for Christmas - a story that really seemed to affect Ritsu, as he had been thinking back to those days at the very beginning of the episode. The idea that they slept together (in the car, I assume) was pretty obvious, but I'm not sure what to make of the end of the episode. They're not particularly "dating", as far as I see it (unless ep05, which I assume to be their next episode, proves me wrong), but it's pretty clear that Ritsu is a lot more open to the concept instead of being so heavily in denial. Having seen the OVA, this is only a re-statement. Ep03 began with Chiaki hard at work on the manga, along with Hatori at his side. It was a pretty cute scene when Hatori begged Chiaki to provide a full-colour spread for that month's publishing since the mangaka meant to do it was in the hospital. Chiaki was having a hard time getting it done, despite trying his best, and a big part of that was because Yuu hadn't really spoken to him since the time Chiaki ran away from the hot springs trip (to Hatori, of course). However, Yuu did come through and showed up, rallying all the assistants together and taking some of the leadership role so that Chiaki could focus on his own tasks. As he said later, Hatori had actually called him for it. In some shoujo, this would blow up a lot more rather than be settled right away. When Chiaki fainted (due to overworking and not sleeping), Hatori spent two days taking care of him (and not going to work). 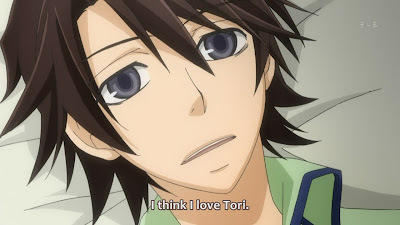 The day that Chiaki finally woke up, he came to the realization that he had really begun to love Hatori (whereas before, he was most likely not so open with his feelings). This kind of warm and fuzzy scene made me really worry about the next one, considering that the situation with Yuu was pretty clearly there. When in a later scene, Chiaki tried to help out one of his assistances by talking her up to Yuu, the truth finally came out: Yuu was in love with Chiaki. I can't really remember if Yuu knows that Chiaki and Hatori are going out (as a definite thing, not just suspicions on his part), but the point of this scene was not for Chiaki to suddenly get feelings of confusion. 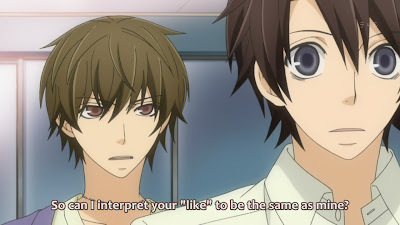 Hatori heard Yuu's confession to Chiaki, and his jealousy kept him from hearing the full extent of Chiaki's response. 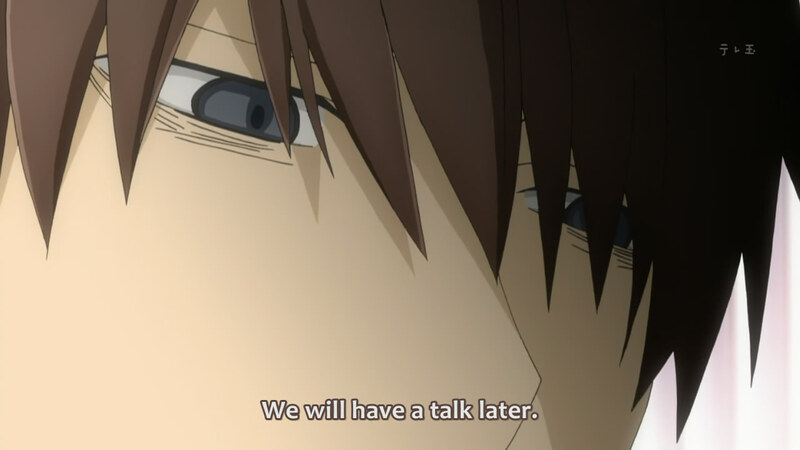 It was nice that Chiaki was so resolute with his feelings; I worried for a moment that he would actually waver. At any rate, the consequence of this conversation was that Chiaki and Hatori didn't speak for some time (other than for work, which wasn't that big of a difference), so Chiaki took it upon himself to set a time to talk one day. 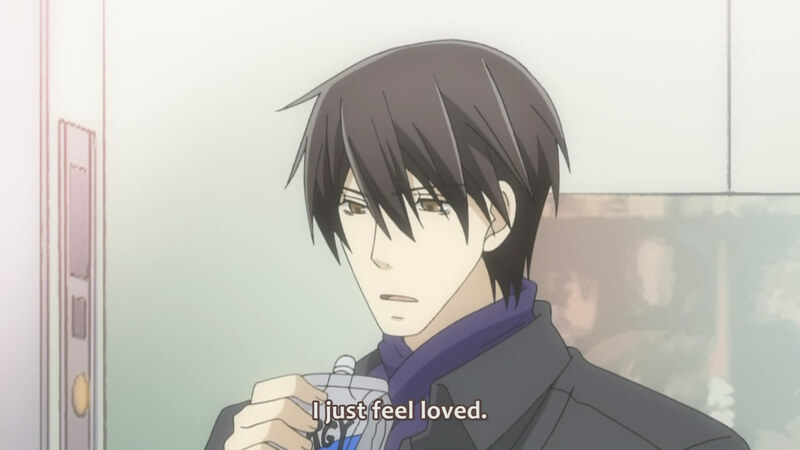 Hatori showed up with lots of emo, as he had apparently been avoiding Chiaki because he thought a break-up was imminent. It was pretty emotional to see just how deeply disconnected he was with Chiaki, despite being in a relationship with him. Hatori's jealousy seems to lead to good things these days. The preview of ep04 shows that the focus will stay on Yuu-Chiaki-Hatori, with perhaps Yuu being more aggressive. Knowing this mangaka, though, I have hopes that it won't turn into "traditional shoujo" with forced kisses and wavering feelings. I'd prefer the happy kind of realism.